This one at Holly and Forest. More Yuppifying the city? At least this gives walking more appeal. Walking is a good thing to promote. 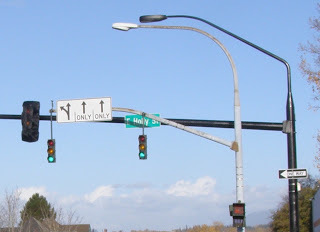 Fancier streetlights and stoplights replacing the old standards at Holly and Forest in Bellingham. It's okay, even though a lot of improvements are mostly appearance. A similar emphasis on appearance takes place in private enterprise. Think about store fronts and advertising. How about people who are into fashion? Eventually the old gray pole will be removed, I assume. Pragmatic conservatives might ask, "what's the matter with the old standard?" Crosswalks starting to wear out. 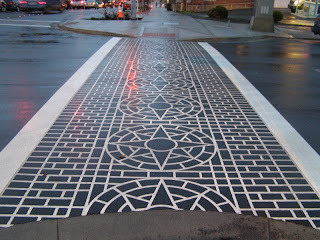 Maybe rainbow crosswalks, like in Vancouver, BC at Denman and Davie Streets are better? I noticed that some of the crosswalks are already starting to get gray where tires are continually going over them. They look really nice but I wonder about their functionality? I notice the tire marks and dirt also (like in above comment) on crosswalks, but it seems like that dirt washes away during a rain storm. Also the street sweeper helps.